The monumental bestseller Quiet has been recast in a new edition that empowers introverted kids and teens Susan Cain sparked a worldwide conversation when she published Quiet: The Power of Introverts in a World That Can't Stop Talking. With her inspiring book, she permanently changed the way we see introverts and the way introverts see themselves. The original book focused on the workplace, and Susan realized that a version for and about kids was also badly needed. This book is all about kids' world--school, extracurriculars, family life, and friendship. You'll read about actual kids who have tackled the challenges of not being extroverted and who have made a mark in their own quiet way. You'll hear Susan Cain's own story, and you'll be able to make use of the tips at the end of each chapter. There's even a guide at the end of the book for parents and teachers. 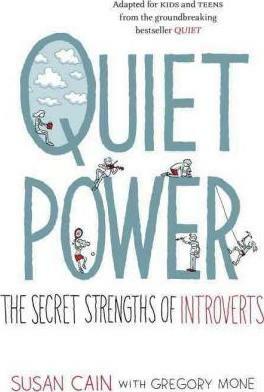 This insightful, accessible, and empowering book, illustrated with amusing comic-style art, will be eye-opening to extroverts and introverts alike. Susan Cain is a graduate of Princeton and Harvard Law School. She worked as a corporate lawyer and then a negotiations consultant before deciding to write Quiet: The Power of Introverts in a World That Can't Stop Talking. That book became a phenomenon, translated into more than 35 languages and on the New York Times bestseller list for several years. She lives on the banks of the Hudson River with her husband and two sons.